Rory Skinner missed out on a debut win in the Pirelli National Superstock 600 championship by a mere 0.009 second after being outdragged across the line in a thrilling 22 lap race at Knockhill. 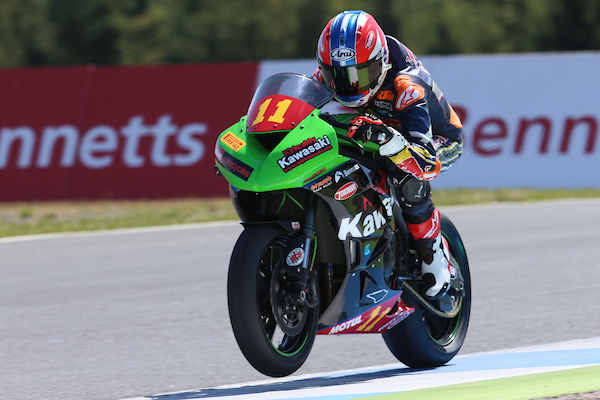 Riding his Bennetts Tokheim Kirkcaldy Kawasaki ZX-6R, the 16-year-old Perth rider was involved in a race long battle with Korie McGreevy that took a photo finish to decide. After a less than perfect start, Rory ended the first lap in fourth place. The young Scot made his intentions clear with a blistering sub-51 second second lap, and he hit the front on lap four – shortly after series leader Ryan Vickers had crashed out of the lead group. A four lap spell behind the pace car saw the pack bunch up mid-race, before Rory set out his stall with a series of fast laps that saw him take the lead and establish a new class lap record of 50.603, an average of 90.13mph around the undulating 1.27 mile circuit. Despite his best attempts, Rory was unable to shake off the attentions of the Northern Irishman and his 675cc Triumph and the duo gave the large Knockhill crowd plenty to cheer about as they traded places, never separated by more than two-tenths of a second. Rory led going into the final hairpin for the 22ndand last time and held a small advantage coming out of the final hairpin, but his rival pushed him wide on the exit of the corner, with the extra capacity of the Triumph’s three-cylinder telling on the run up to the chequered flag and McGreevy getting the nod as they crossed the line side-by-side. By finishing on the Superstock 600 podium, Rory was offered a place in the 24-lap Dickies British Supersport Championship race. Despite starting from the back of the grid, in 27thplace, and giving away some 15-20bhp to the fully tuned supersport machines, Rory slashed his way through the field, lapping consistently below his new Superstock 600 lap record, and working his way through a stunning 13that the end of the 26 lap race, running lap times that would have seen him placed well inside the top ten with a more advantageous starting position. “I really enjoyed that,” Rory added. “It was nice to go into a race with no expectations and I just went out to have fun. It was hard work as I got held up in traffic in the early laps, but once I worked my way through I was able to set good, consistent lap times and catch the group in front. Rory will compete in two Scottish championship rounds on the ZX-6R in July, before resuming his British Talent Cup duties at the GoPro British Grand Prix, at Silverstone, on the weekend of 24-26 August.